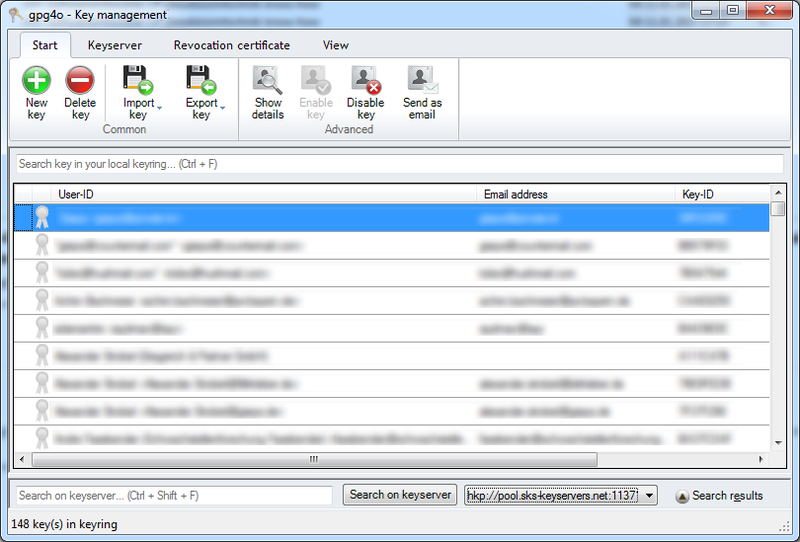 What is the most usable software for email encryption that has manual key management? In case some are unaware of its meaning, manual key management is where users (not programs) are left in charge of generating, exchanging and storing their cryptographic keys. This application should be easy to use, even for people without prior experience with cryptography (e.g. with PGP). I'd like to recommend GPG4Win. It's an open source software that run's on Microsoft Windows. It contains a tool called Kleopatra which provides a really nice GUI interface for managing keys. It doesn't require any technical knowledge to use. It's also quite powerful as you dig deeper into the application. There is also GnuPGk, another application for Windows written in C#. It too is open source and very easy to use. It will provide another key management solution for you. A GnuPG Frontend GUI made in C#. It is compatible with PGP as well so it can be a very useful tool for encryption/decryption. It also incorporates a shell extension so it can be easy to right click and decrypt or decrypt. I would recommend gpg4o. It integrates perfectly with Outlook and comes with an integrated key management. IMHO gpg4o's keymanagement is easier to use than Kleopatra. Since last year they offer also a free version for private use. Not the answer you're looking for? Browse other questions tagged email security encryption email-client or ask your own question.